I received free samples of Cabot Cheese mentioned in this post. By posting this recipe I am entering a recipe challenge sponsored by Cabot Creamery and am eligible to win prizes. I was not additionally compensated for my time. Wowza. 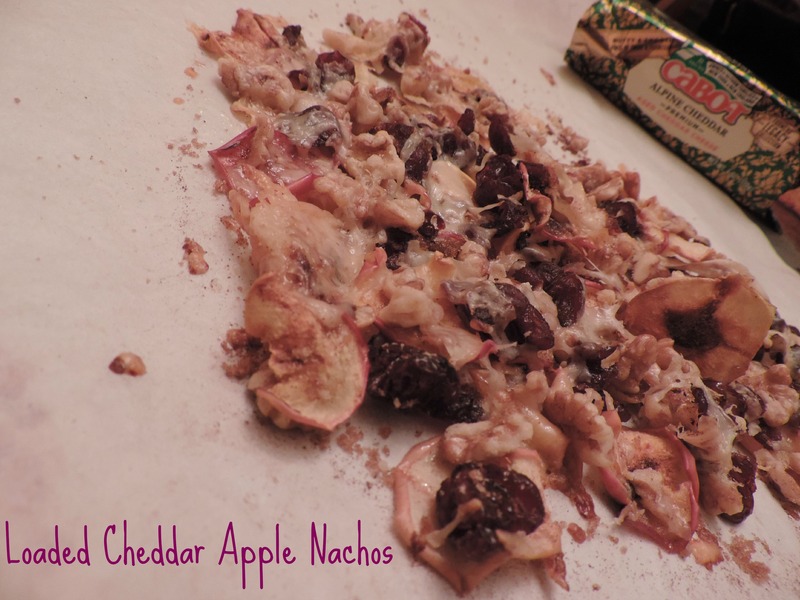 When Cabot Creamery tasked us with creating a lightened-up appetizer fit for game day and red carpet parties, I never dreamed that I’d create something as delicious as these Loaded Cheddar Apple Nachos. But I did guys, and I would love nothing more than to share the recipe with you. It all started when two packages filled with Cabot cheese arrived at my doorstep…so basically the best gift you could ever receive. At first I was a little overwhelmed with all the cheese, but then I snapped back to reality and realized that there is no such thing as too much cheese. It was time to create a delicious recipe. It’s all about the cheddar here, guys. 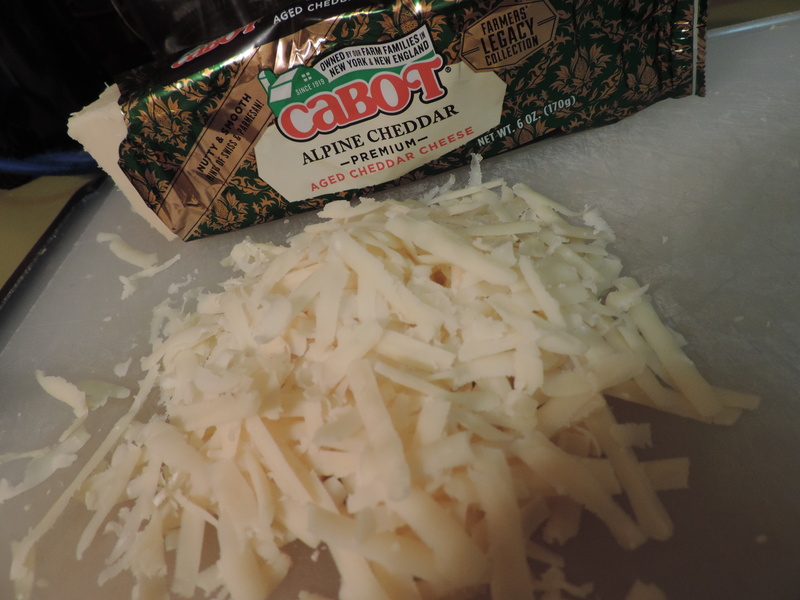 I fell in love with Cabot’s Legacy Collection Alpine Cheddar. To me, it’s almost reminiscent of an aged Parmesan. I also learned that Cabot’s cheddar cheeses are naturally lactose-free (can’t wait to tell all my lactose intolerance clients and friends)! Even more awesome is the fact that Cabot Creamery is a family-farmer owned cooperative of more than 1,200 farms located throughout New England and New York. One-hundred percent of Cabot’s profits go back to their farmers. Can’t ask for anything better than that! I really do have to pat myself on the back for this recipe. It combines sweet and savory, lots of texture from the toppings and is warm and gooey and perfect for game-day parties. I hope you enjoy! If you don’t have walnuts, use almonds or pecans. Don’t like cranberries? 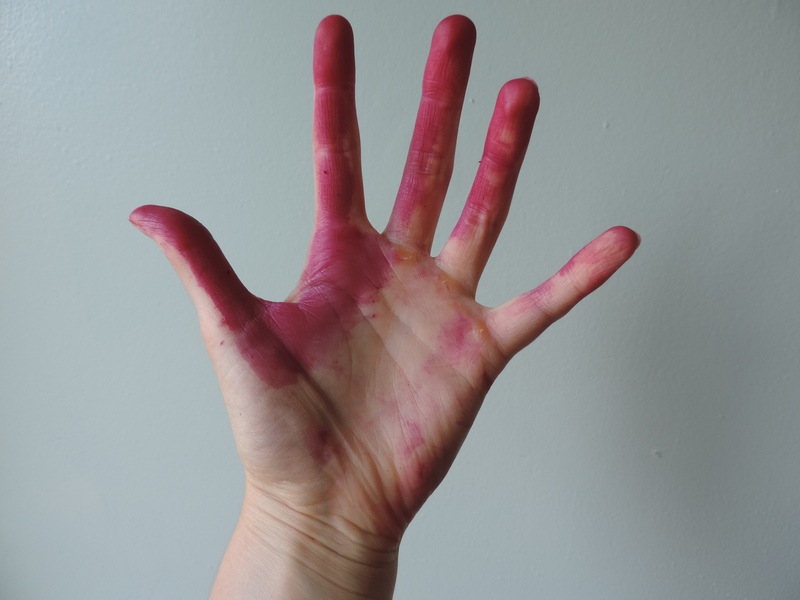 Try tart cherries or raisins. Drizzle with honey or maple syrup if you’re avoiding grain sugar. I used the ever-so-fast microwave method to make the apple chips, but if you’d rather bake them, you can cook each side in a 200 degree oven for about 1-1.5 hours. Slice apples thinly using a mandolin or sharp knife. They look prettiest when you slice horizontally, though they are harder to control, so feel free to slice vertically if that’s easier. Don’t worry if you don’t get a perfect slice — slivers work just as well here. Line a large, microwave-safe plate with parchment paper. Working in rounds, lay apples on parchment paper in a single layer. Microwave for 3-4 minutes, or until edges of apples start to curl. Flip slices over and microwave another 1-2 minutes. 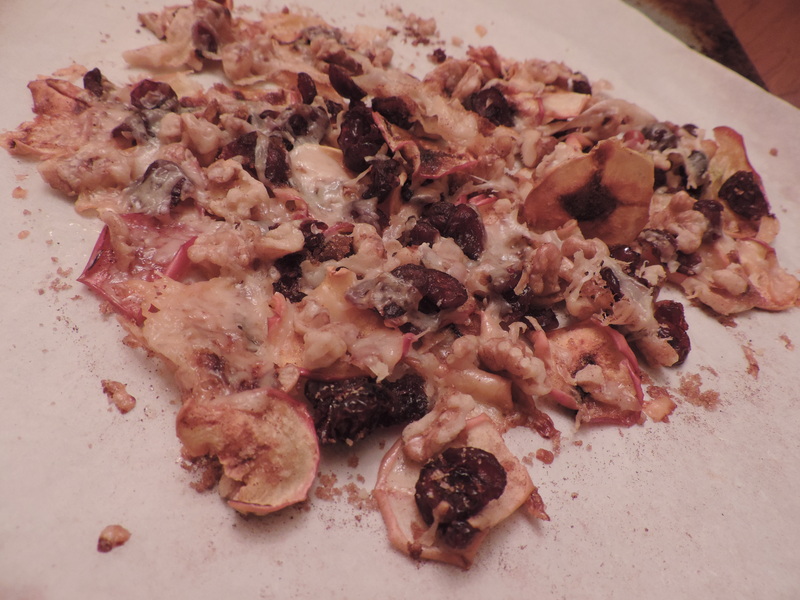 Lay apples out on a parchment paper-lined baking sheet and let sit. They will start to harden the longer they sit. Make sure to keep a close eye on the apples to ensure they’re not burning (ruined a few slices this way). 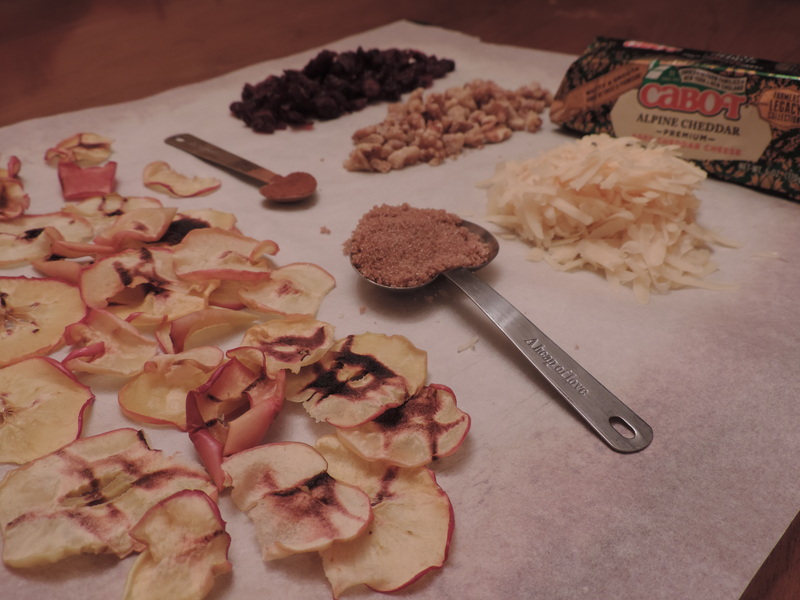 Once all the apples are “chip-ified,” arrange them on the parchment-lined baking so that they overlap slightly. 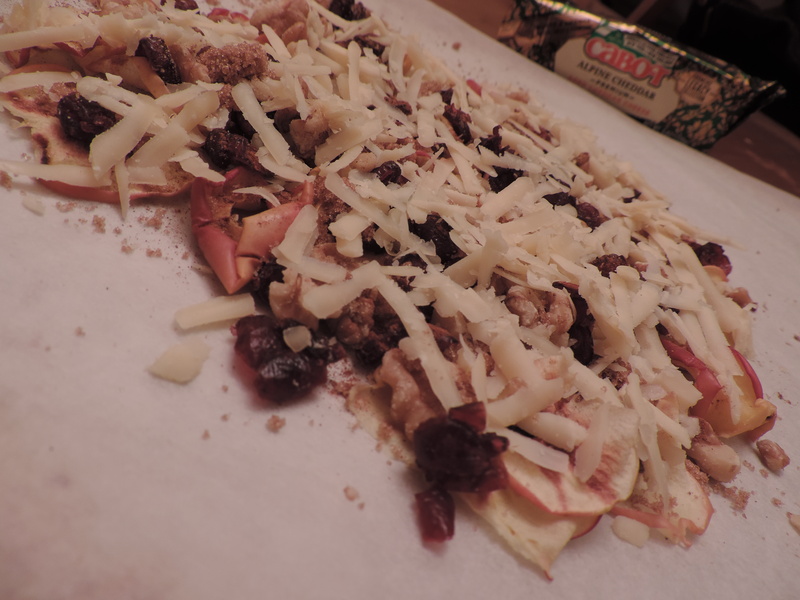 Sprinkle with cranberries, walnuts, cinnamon, sugar and then finish with grated Cabot Alpine Cheddar. Bake for 10-15 minutes, until cheese is melted and slightly toasted. Mmm, booze. Who doesn’t enjoy a cocktail every night on occasion? I thought of about a thousand and one different recipes that I wanted to make, most of which involved raki, an unsweetened, anise-infused alcohol (similar to the Greek ouzo) that is the national drink of Turkey (where my dad is from). After a failed search for raki, however, my plans changed. 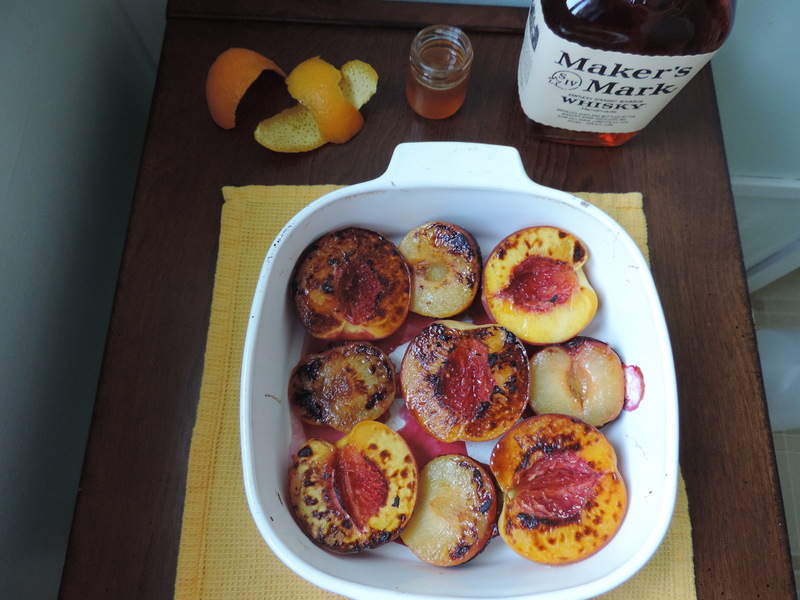 It became all about the bourbon, specifically, Maker’s Mark. I will admit that I generally only like to drink clear alcohol (e.g. 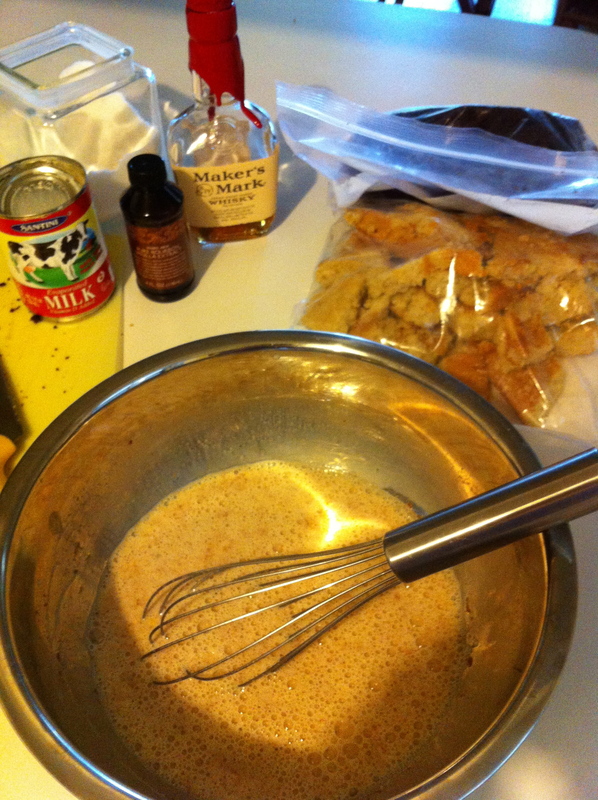 vodka, gin) but for desserts, bourbon can’t be beat for the amazingly rich, deep flavor it lends. Now I love a bourbon caramel sauce over bread pudding (see my recipe for Bourbon Caramel Cake Pudding), but I wanted to lighten it up. I promise you, you won’t even miss the bread pudding on this recipe. I don’t even like Old Fashioneds, but when you reduce all the ingredients to a sauce…perfection! You’ll want to put the sauce over EVERYTHING — ice cream, pancakes, waffles, into coffee, etc. 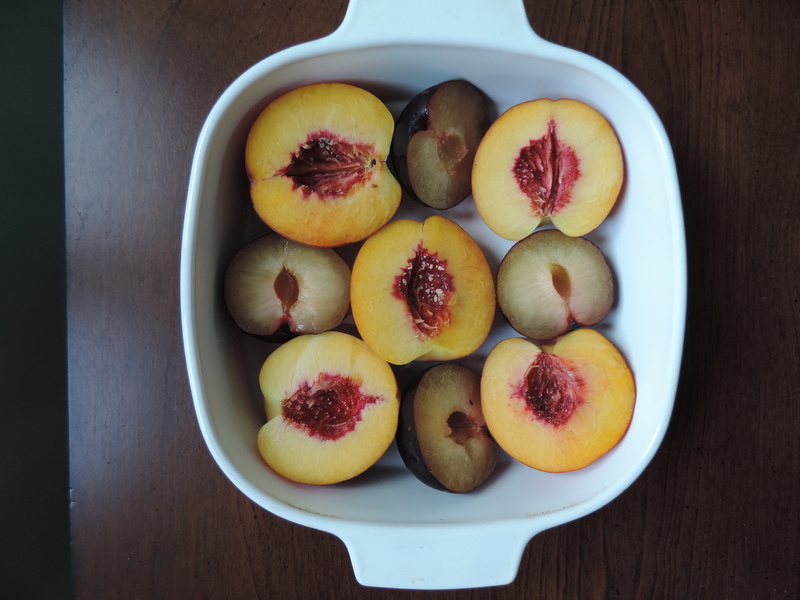 Feel free to use whatever stone fruits you have on hand. Lay, cut side up, in a casserole dish. 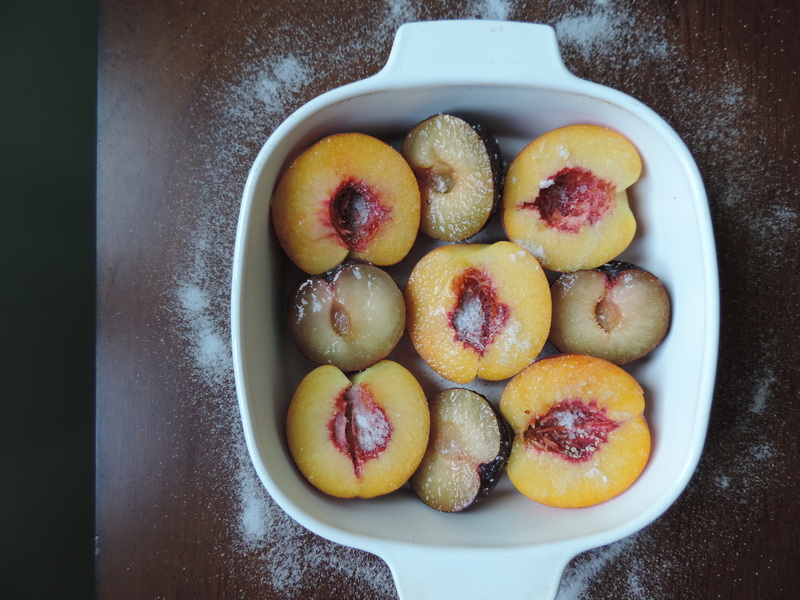 Sprinkle cut side of fruit with 1/4 cup sugar. 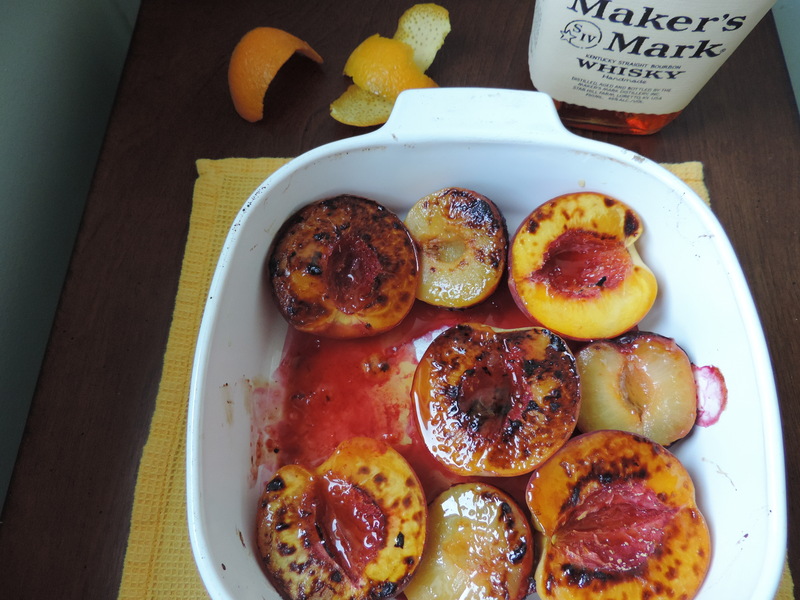 Broil for 5-10 minutes (make sure to check constantly), until you get a nice golden crust on the fruit. 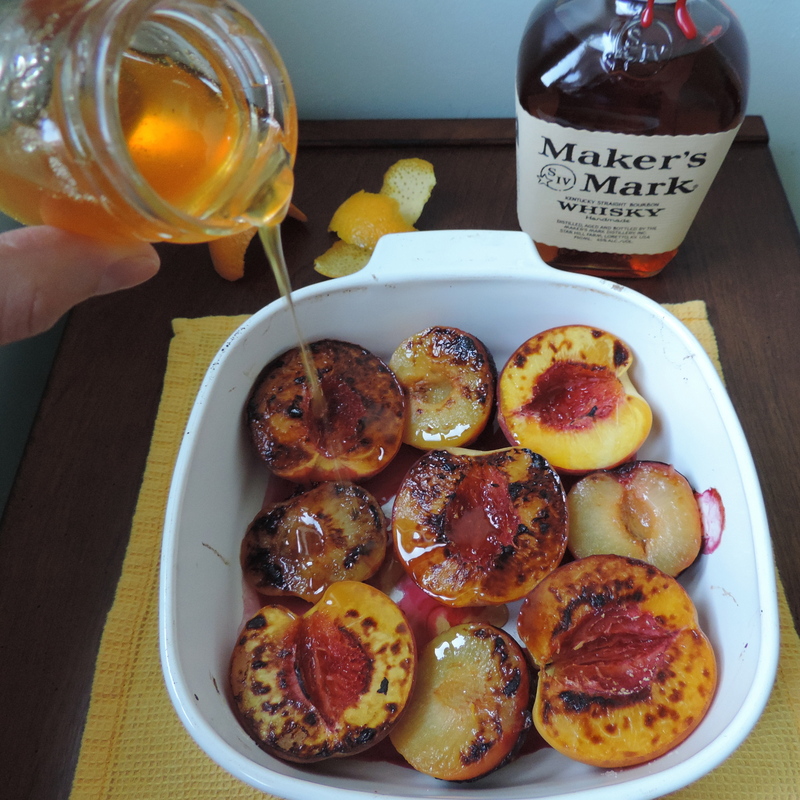 While the fruit is in the oven, add bourbon, 2 Tbsp. sugar and orange juice to a small saucepan. Heat on medium until the mixture reduces to about 1/4 cup. Drizzle “bruleed” fruit with Old Fashioned Reduction. 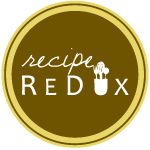 Check out more delicious, boozy creations from fellow Recipe ReDuxers by clicking on the link below. 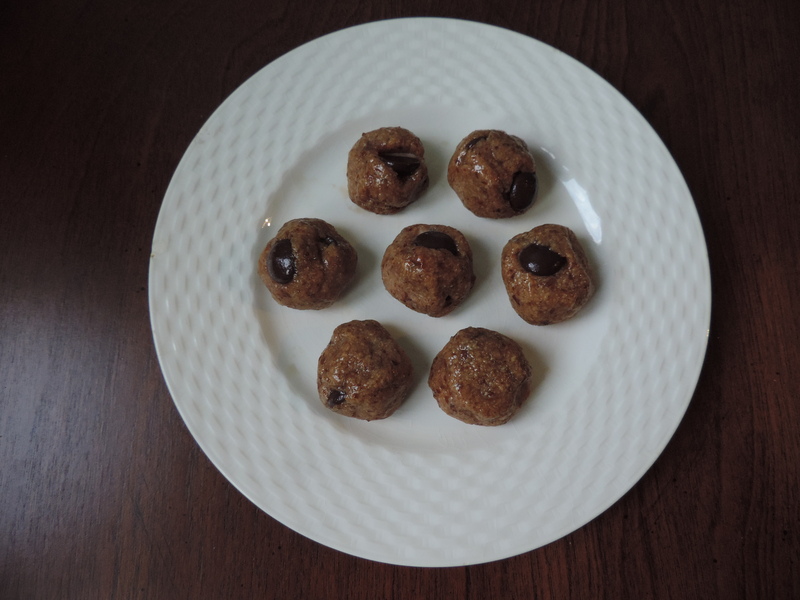 Confession: even dietitians need a treat sometimes. 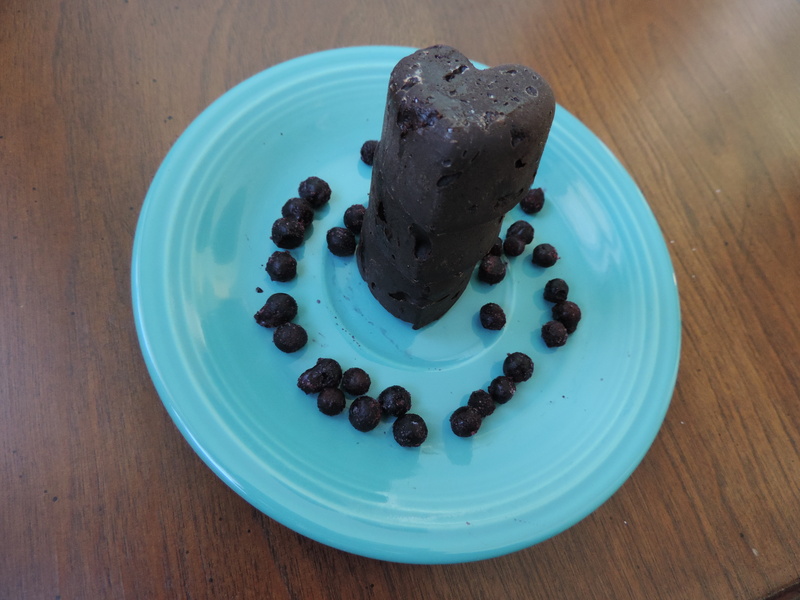 So when leftover cake scraps were offered to me, I figured I should take them and turn them into something even more delicious than cake: cake pudding! Carpe cake?? 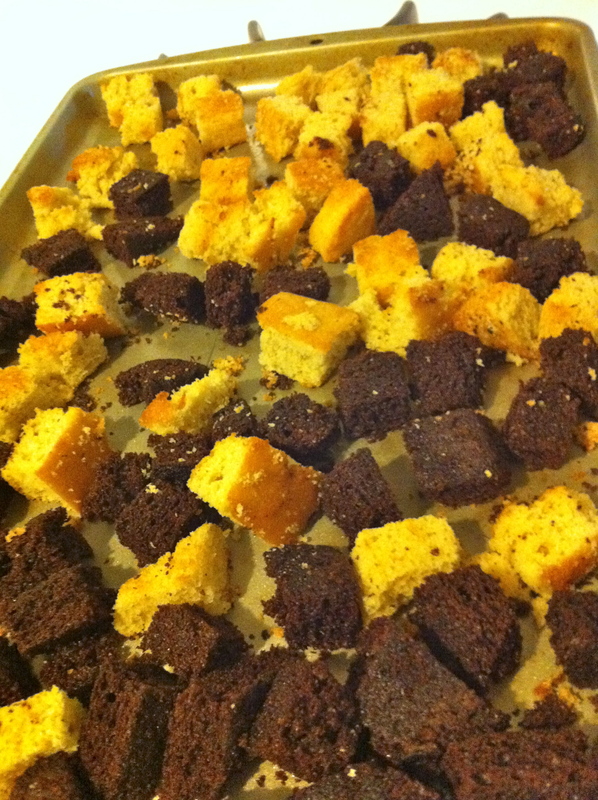 In case you are confused as to what cake pudding is, picture bread pudding, but replace the bread with cake :). Sounds decadent, and it is. I adapted a Cooking Light recipe for Bread Pudding with Salted Caramel Sauce, though, so it is at least a little better for you. 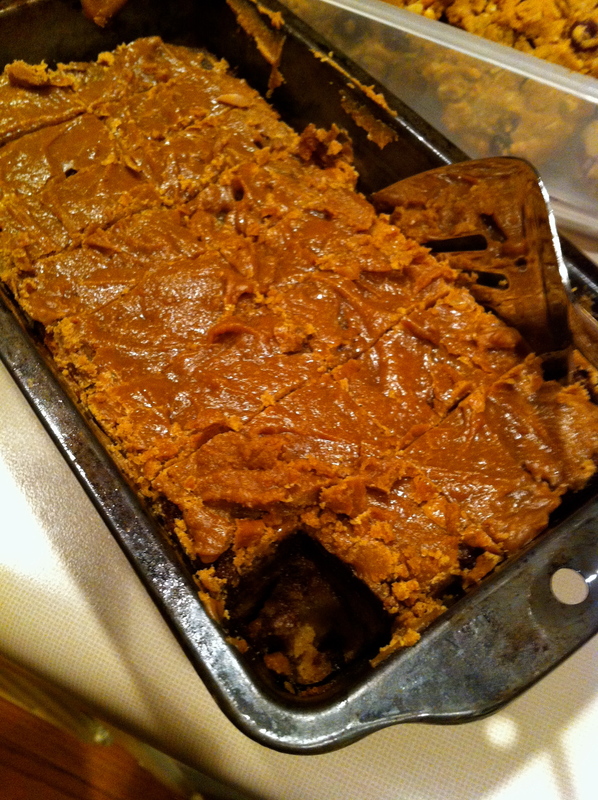 To prepare bread cake pudding, arrange bread cake in a single layer on a baking sheet. Bake at 350° for 8 minutes or until lightly toasted. Combine evaporated milk and next 7 ingredients (through eggs) in a large bowl; stir with a whisk. Add bread cake cubes. Let stand 20 minutes, occasionally pressing on bread cake to soak up milk. Side note: wouldn’t this be the BEST French toast mixture?? 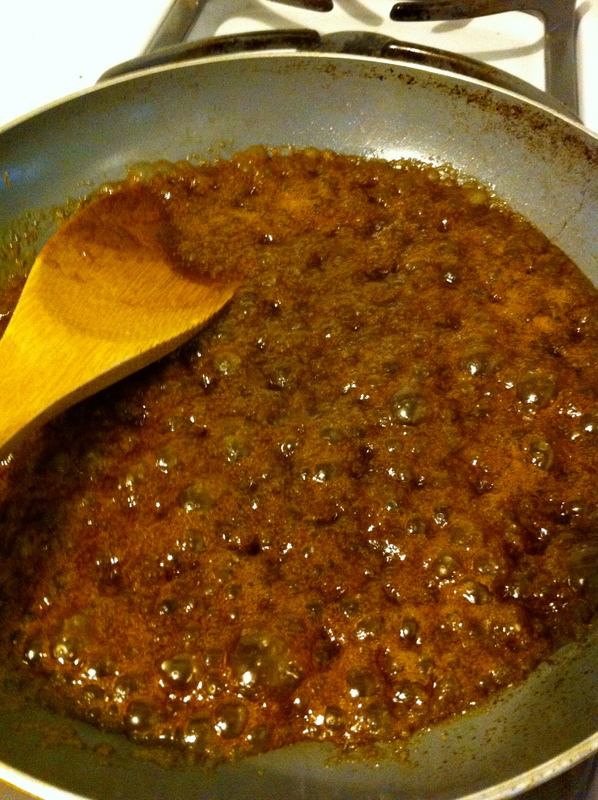 To prepare sauce, combine brown sugar, 3 tablespoons bourbon, and butter in a small saucepan over medium-high heat; bring to a boil. Simmer 2 minutes or until sugar dissolves, stirring frequently. Stir in 5 tablespoons half-and-half evaporated fat free milk; simmer 10 minutes or until reduced to about 1 cup. Remove pan from heat. Stir in remaining 1 tablespoon half-and-half evaporated fat free milk, 1 teaspoon vanilla, and 1/8 teaspoon salt. Keep warm. 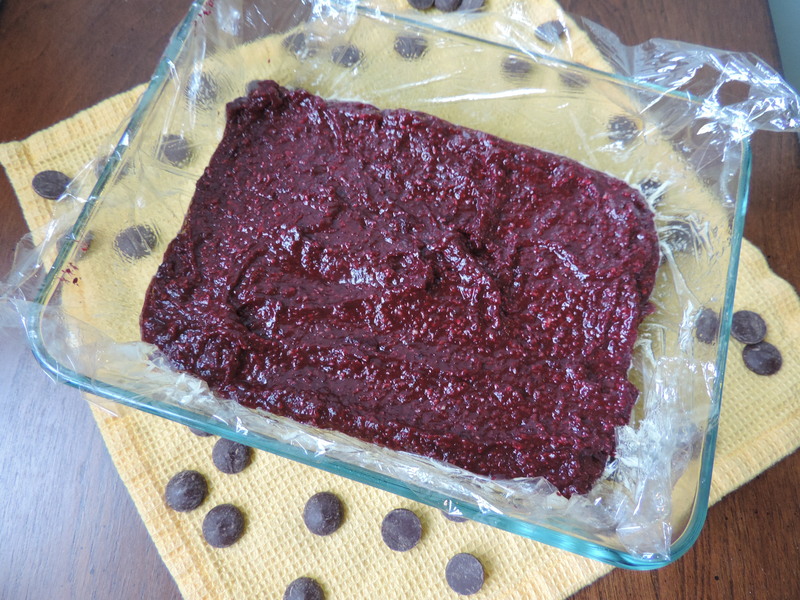 Spoon half of bread cake mixture into a 9 x 5inch loaf pan coated with cooking spray. Drizzle 3 tablespoons sauce over bread cake mixture. Spoon remaining half of bread cake mixture over sauce. 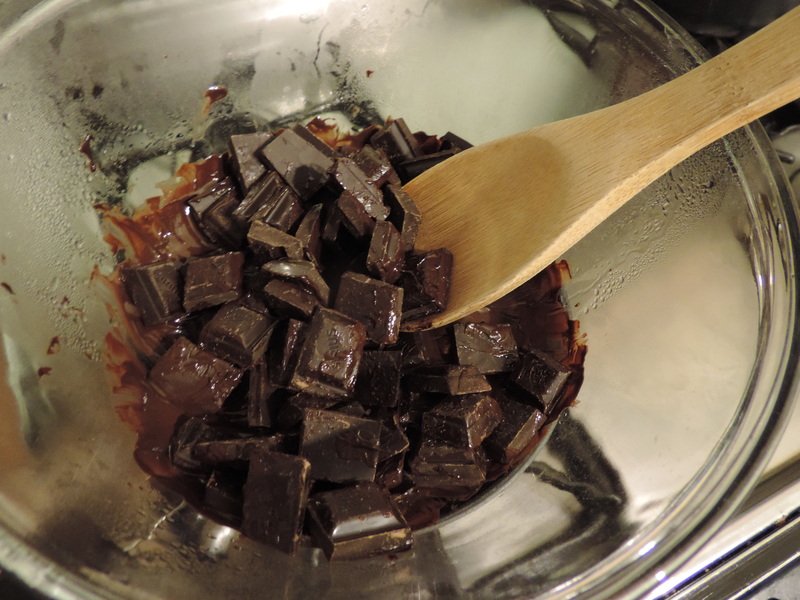 Bake at 350° for 45 minutes or until a knife inserted in the center comes out clean. Serve warm sauce with bread cake pudding. French macarons are my latest obsession. Picture the most amazing sandwich, but replace the bread with two perfectly round, crunchy on the outside/chewy on the inside meringue-like cookies and replace the meat with filling of choice (ganache, buttercream, preserves…the possibilities are endless). Yup, I’m pretty sure that a macaron beats a regular sandwich by a landslide. 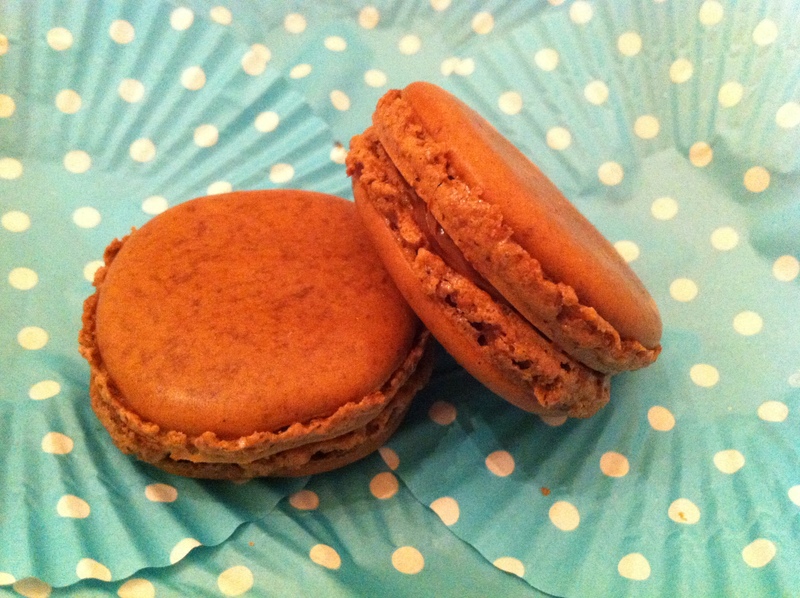 Now, if you know about macarons, you know that they are notoriously tricky to make. Between the egg white meringue and the fact that you have to pipe them to make those perfect little circles, I had my work cut out for me. Plus, this was my first time ever trying. CHOCOLATE NUTELLA MACARONS! Chocolate cookies with a nutella shmear in the middle. Heaven! All in all a great first attempt at making macarons. 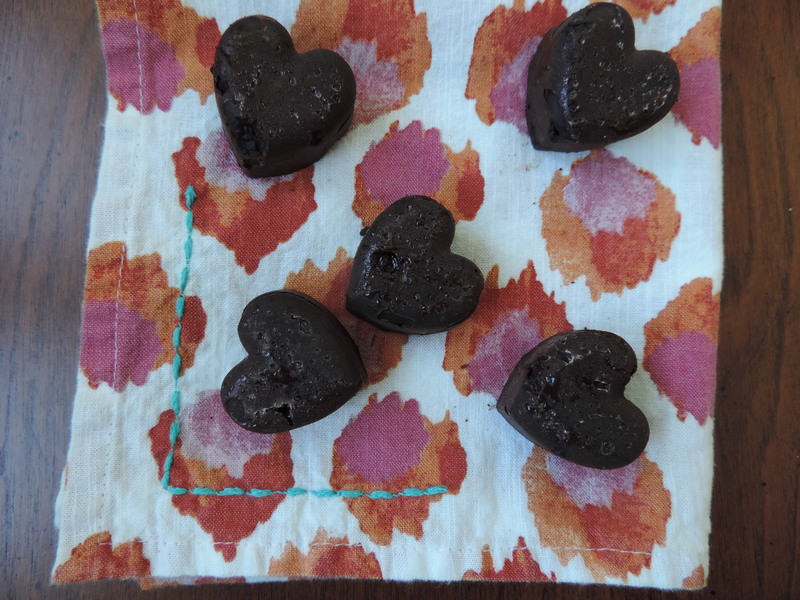 Find the recipe at yumsugar (extremely thorough and with great instructions). This saved my life – er, my macarons. 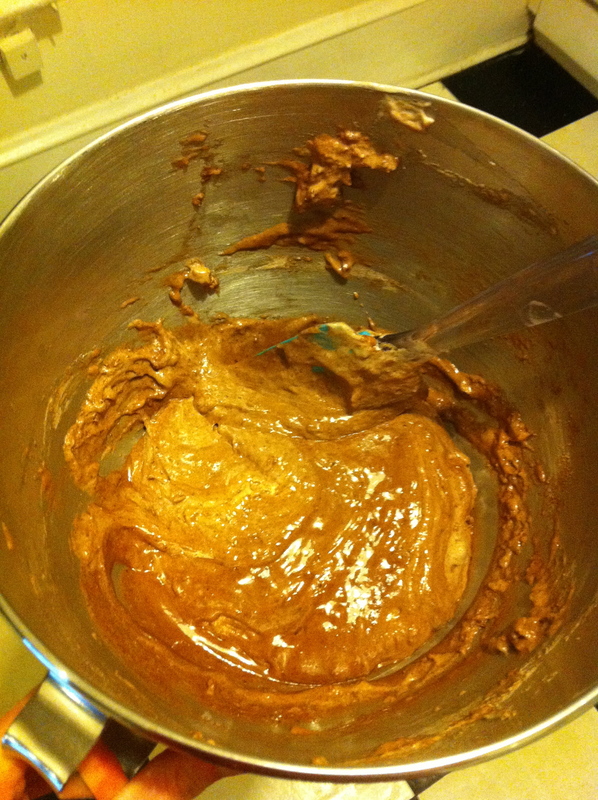 The only alteration I made was to add 2 Tbsp of cocoa powder to the dry ingredients. First, make the macoranage (the egg white/almond meal mixture). 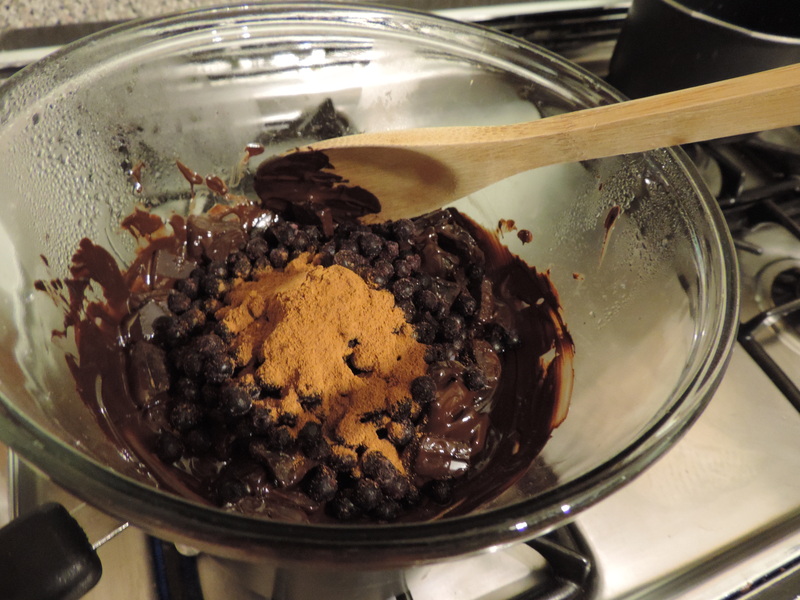 This should be the consistency of molten lava and should flow in one continuous stream from the spatula to the bowl (if it drips rather than flows, you need to continue to work the batter). 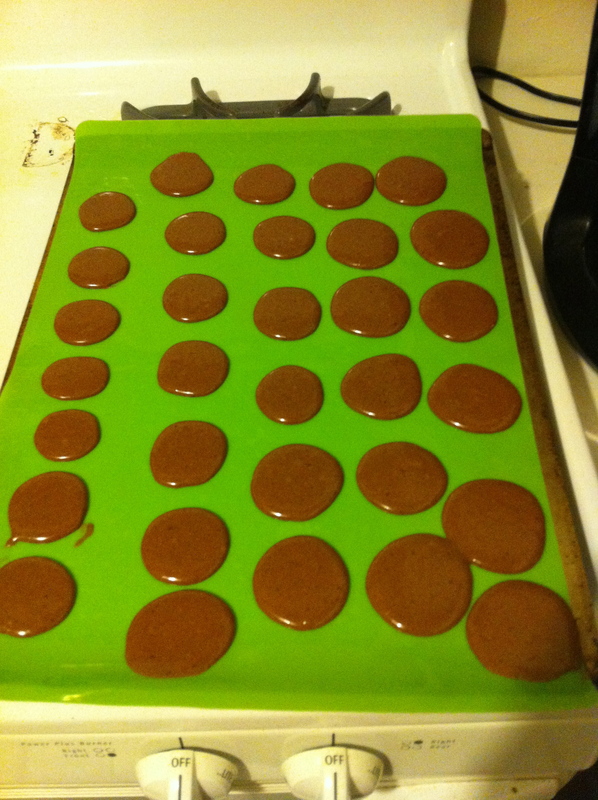 Then fill your piping bag and pipe small circles onto a silicon mat. This is the only thing I “screwed up.” I should have used a larger tip on my piping bag. I used a smaller one and actually swirled little circles on rather than putting a circular dollop down. The latter would have created a puffier, taller cookie. Mine were flat…but other than that, they worked out. Make sure you rap the pan on the counter a couple times to settle the cookie. Also, it’s crucial to let it sit for at least 15 minutes so that the tops form a shell (so when you touch them they’re not sticky). Once that shell is formed, bake at 280 for 15-18 minutes. See the feet at the bottom (the bubbly-looking part)? That’s what you want. The cookies should be easy to get off the sheet. If not, they need a couple more minutes in the oven. My first batch wasn’t in for long enough, and so as you can see, the bottoms got a little messy when I tried to take them off the sheet. 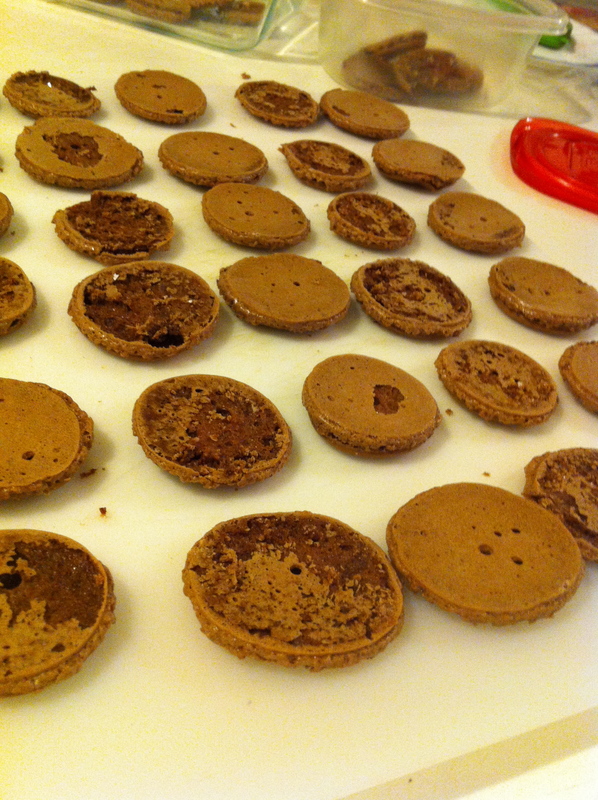 Spread some Nutella on the good bottoms (the ones that didn’t get stuck to the pan), and voila! 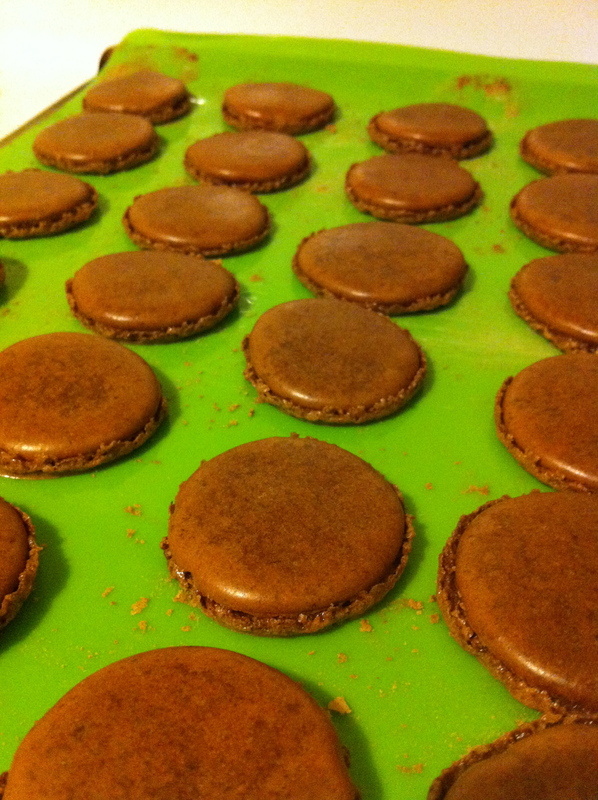 Amazingly chocolatey French macarons. They had the perfect crunchy shell and smooth, chewy inside.